Time for a little vacation in Berlin with my fellow beer-buddies. Wurst, Bier, Heidi und Schlager. What does a men need more? But before we can become “Berliners”, first a little-big story about portal-culling. The best part about programming is doing the stuff you like, with quick results. Adding the last straws on the other hand... Don't know about you, but in my case it often leads to 90% finished parts. The other 10% is... well, for another day. Of course, with limited time you can't fine-tune everything till perfection. At the time it's perfect, it's probably also outdated, in this insane fast evolving software world. But sometimes you forget about important missing parts. Now that all Radar Station maps are imported, I noticed a relative low framerate on my laptop (~20 to 24 FPS). Now my laptop isn't the fastest anymore, but suddenly I remembered I didn't finish the portal-culling engine... This particular map has quite a lot of rooms and walls between them, resulting in a lot of overdraw. For those unfamiliar with (portal)culling, or rendering performance in general, this technique helps preventing stuff from getting rendered for nothing. Unless you are spying or wearing X-Ray goggles, "rendering" the interior of your neighbor’s house is useless, cause you can't see it anyway. Walls and stuff. If we don't cull, invisible parts of the map will be called for nothing, and pixels will be drawn on the screen, and then get overdrawn by something else in front = a waste of time. In an ideal 3D world, each pixel will be drawn only once (asides overlapping pixels with alpha blending enabled). A deferred-rendering engine already helps reducing the lighting complexity, but when rendering the contents for your deferred pipeline (data textures), shadow/depth Maps or other passes, you still want to exclude rooms you can't see. Or how about rooms you can only see partially? Behind a door or window, there could be st.Paul’s Cathedral. Yet you only see the bits behind the opened doors/windows ("portals"). 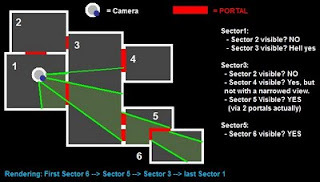 With portal-culling, you divide your world into rooms, hallways, terrain chunks, or as I would like to call them: “Sectors”. 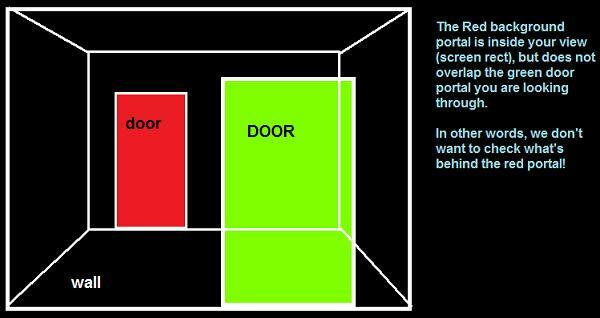 The openings between them (open space, doors, windows, holes, ...) are called "Portals". 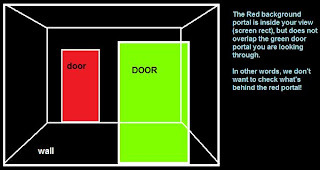 In a perfect definition of a sector, for each corner(vertex) of a “room”, you can see all other corners of the same room without obstacles between them. But you can cheat a bit of course. Since rendering works best with bigger batches of data, try to prevent ending up with hundreds of tiny sectors. Because you will render sector by sector. ............4- Add the sector behind the portal to the list, IF not done before. ............ Be aware that the same sector can be visible through multiple portals. ............5- For each sector, manage a list of portals that made it visible. Add ............ this portal to the sectors list. Now when you go rendering your world, just loop through that sector-list. Eventually do it backwards to help with the depth-sorting for alpha-blended/transparent surfaces. The furthest sectors will be rendered first, your current sector last. Oh, and did I mention this "visible sector list" is also handy for other stuff like updating lamps, A.I., and vegetarian cooking? Having a list of visible sectors helps you to exclude unnecessary checks. Now that's easy, just a recursive function, some looping, little list... done. But wait, as said, there are some catches. Circular references may occur, and how the hell do you know whether a portal is (partially) visible or not? If you are like me, you Googled "triangle sphere collision" and the likes quite some times. But "portal(or quad) versus frustum test" didn't gave me a lot useful results. Mostly you'll need combinations of functions, as collision-test routines are often incomplete. In case your portals are quads, they can be fully inside your camera frustum, intersect it, or completely overlap it (when standing nearby a big portal). And that's where I didn't finish the code. Just made a cheap check to make sure portals would be visible. But due the margins, invisible sectors still became visible according to the checks. Time for a revision. Checking if 3D stuff collides, intersects or overlaps isn't so easy. Narrowing the view-frustum when it travels through a portal neither. Checking if 2D rectangles overlap on the other hand... So why not do the math in 2D? It still has a few flaws, but at least it's an easy way. And a solution that actually works is also worth something right? With this MVP matrix, you can convert 3D points to 2D space, in the range[-1..+1]. If you like, you can multiply further with the screen-resolution to get real screen pixel coordinates, but we don't need that here. Oh, AND your 2D point should also carry a Z. You can use the Z to check whether a point is in front or behind the camera-view frustum. The -1, +1 are the screen bounds, the Z tells if a point is in front or not. That's how you can check a single point. But, Portals aren't just points right? Portals can be seen as quad (since doors and windows are rectangular). But if you really like, you could also make complex shapes such as... circles, or... kangaroos. What I do is simplifying the calculation by making simple rectangles out of whatever shape you want to check. First of all, your own view-frustum happens to be a rect; the entire screen. But hold on, your frustum may get narrowed as it passes through portals! (See Scissor chapter below). Next is the portal. Simply loop through all its (vertex) points, convert each one to 2D, and determine the most left/right/top/bottom ones. That makes a rectangle, or 2D “bounding box”. rect1 := viewFrustumRect;  // "screen"
Still alive? Bon, because you're almost through the math-part. There is still one nasty bug at this point though, don't raise the flags yet. * Always expand your portal 2D bounds a little bit to prevent leaky edges. This was one of the reasons why the Radar Station maps went slower and slower. 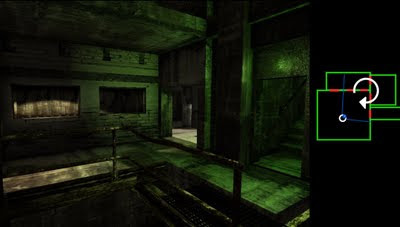 Pretty much all rooms had an opening to another sector somewhere, so at some camera angles, the entire map would be rendered. While you only saw ~35% of it. A waste of precious horsepower. Just adapt to the portal rect. That's it. In the recursive "PortalCulling" function, narrow the frustum each time it passes through a portal. And don't forget your view might enter the same sector via multiple portals, resulting in different results. Narrowing the view prevents portals that are in the view, but occluded by foreground geometry to be evaluated. But it still doesn't fix the huge overdraw when rendering a gigantic sector behind a tiny portal. Call in the Scissor Sisters. Yet another great feature of 2D rectangles, is... 2D rectangles. In OpenGL, you can tell where to draw by giving up a rectangle, and enabling "scissor testing". Pixels inside the rect will be drawn, others outside will go to the pixel hell. This is why I added the portals to a list(per sector) as well in the Portal Culling function. So later on, when looping through that list, just BEFORE rendering the sector, you can setup a scissor. In case you found multiple portals you might activate multiple scissor rects (not sure if this is possible), or just combine the portals to make 1 bigger rect. Don't always hurt yourself with math, enjoy life. With a scissor enabled on the portal, only the visible part of a sector will be drawn, no matter how !#@$ big it was. However, it does not prevent the render-calls. All triangles / objects inside that sector will be pushed, the scissor just discards pixels that didn't fall inside the rectangle. If you have massive amounts of objects / vertex-data, you may want to split up the sector in smaller chunks. And don't forget about LOD systems. Portal Culling can help a lot, but still doesn't make your game fly of course. Games like Crysis or GTA use lower-poly meshes or even sprite billboards for distant objects. 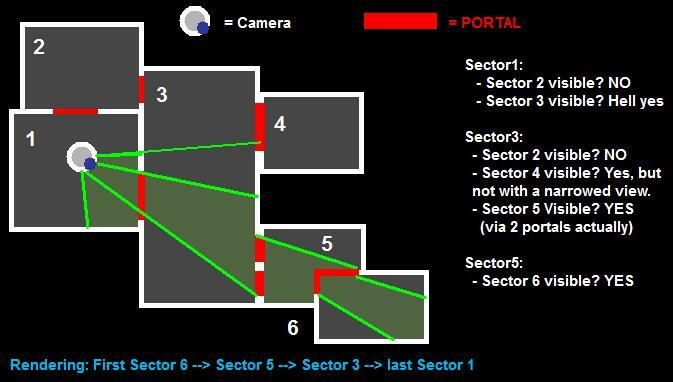 Two or only one point of the (quad) portal are in front of the camera, and will produce normal 2D coordinates. The other points are somewhere behind the camera. Math wouldn't be math if there wasn't always an annoying exception on the rule. If all points still had a positive Z value, there is nothing to worry about. The portal rectangle will be partially outside the screen-bounds, but that doesn't give any problems. But in this case, the rear-portal points have a negative Z value. So, when doing the division with Z, the X and Y coordinates will get mirrored too. if ALL points were negative, the test failed. At least 1 point has to be in the foreground. If you forget this, portals behind you can get visible as well. In this particular case, first the room behind the 3 windows will be checked. This room has a door that leads to a toilet on the right. This toilet has another door that leads back into the big-room we started from. Although the toilet exit door is in front of the background room door, all their 2D rects will overlap (one shortcomings of doing 2D checks). In other words, after our toilet visit in the recursive functions, we get back to the main-room. This isn't so bad, but we have to be careful not to add the room twice. But neither should we stop as soon as we detect an already-inserted room. 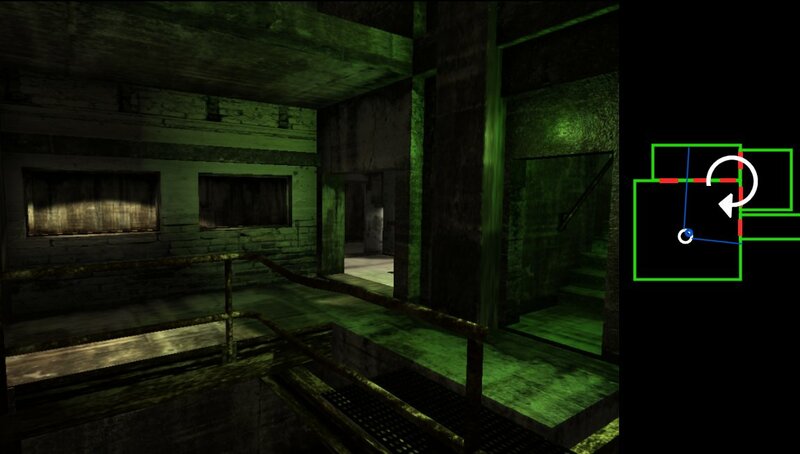 Since we entered the room via a different route, it may show other portals that weren't visible before. This gives yet another problems: infinite loops. To prevent walking circles, you can block portals. Once checked, they can't be checked again. But… this leads to wrong scissor-rects though, or even missing sectors. In complex situations, the same portal might be visible through multiple foreground portals. Each "route" can lead to different results, and will also produce a different scissor-rectangle. Crikey, how to deal with that? Not blocking means infinite loops. Blocking means incomplete data. So instead of just blocking a sector or portal right away, I look if the sector was already made visible by a(nother) portal with equal or a bigger overlapping rectangle than the current one. Ifso, no need to check. Because it can't produce new results anyway. Well, enough Portal Culling. 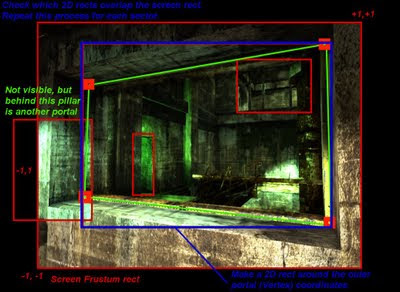 The 2D approach has some flaws and still can evaluate portals that aren't really visible for the camera. Yet it's a relative simple (and fast) way to do culling. Just make sure your loop really checks all scenario's, in case parts of the scene are missing. Making a game, father, hanging around with friends. Regular guy. Could the real Da Vinci please stand up?